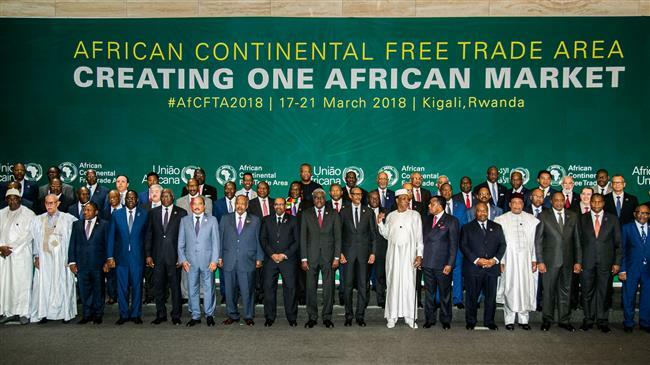 “The agreement establishing the CFTA (African Continental Free Trade Area) was signed by 44 countries,” said Moussa Faki Mahamat, chairman of the AU commission. Nigeria is notably absent from the signatories after President Muhammadu Buhari pulled out of this week’s launch in Rwanda saying he needed more time for consultations at home. One of Africa’s largest markets, Nigeria hesitated after objections from business leaders and unions — a sign that getting the deal through scores of national parliaments may face several hurdles. “Some countries have reservations and have not finalized their national consultations. But we shall have another summit in Mauritania in July where we expect countries with reservations to also sign,” said Albert Muchanga, the AU Commissioner for Trade and Industry. However other economic powerhouses South Africa, Kenya, Morocco, Egypt, Ethiopia and Algeria — known for strict protectionist policies restricting imports and exports — did sign the deal. If all 55 African Union members eventually sign up, it will create a bloc with a cumulative GDP of $2.5 trillion (2 trillion euros) and cover a market of 1.2 billion people. Currently, African countries only do about 16 percent of their business with each other, the smallest amount of intra-regional trade compared to Latin America, Asia, North America and Europe. And with average tariffs of 6.1 per cent, businesses currently pay higher tariffs when they export within Africa than when they export outside it, according to the AU. “If we remove customs and duties by 2022, the level of intra-African trade will increase by 60 percent, which is very, very significant,” Muchanga told AFP in an interview before the summit. The CFTA is a key part of the AU’s long-term development plan Agenda 2063, which calls for easing trade and travel across the continent. At its most recent summit in Ethiopia in January, AU member states agreed to a common air transport market that could drive down airfares, as well as plans for visa-free travel for Africans across the continent. Also on Wednesday, 27 countries signed the protocol agreeing to the free movement of persons across the continent.